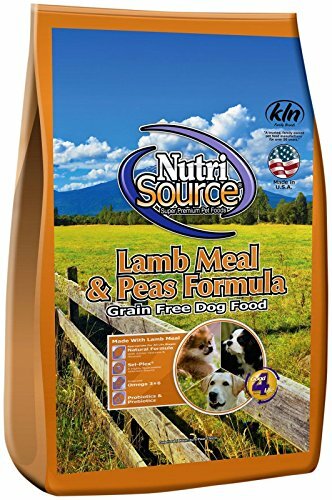 Is NutriSource a good choice for my puppy? Hey there again! If you’re already feeding your puppy with NutriSource, you’ll probably know at least little about this premium, health-focused brand. If not, then we’re feeling good about being able to introduce you to what we consider one of the much, much better brands of puppy food out there. Here’s all you’ll need to know about NutriSource in one convenient place! Why the NutriSource food reviews and NutriSource puppy food reviews? I’m worried about feeding puppy food with oats to my puppy. Can you help? What part do peas play in a puppy food? NutriSource are an all-American brand based in Minnesota, and they’re family-run. All their dog and puppy kibbles are made in the States, in a family-owned factory in Perham. They’ve actually never had any of their products recalled, so they’ve got an unparalleled record for safety that we think is great. It’s possible that they’re a little less well-known than some of the larger and well-reputed dog food brands out there, but this is because they make a conscious effort to stay in control of the ingredients in all their recipes by remaining small. 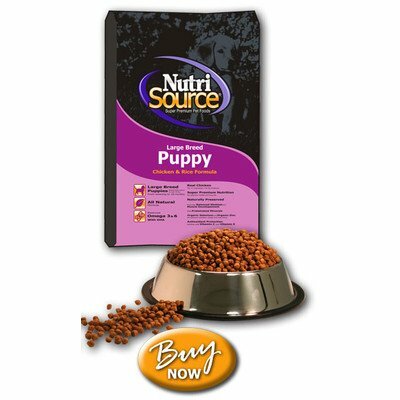 For the same reason, NutriSource are often considered a premium, top-of-the-range puppy and dog food brand. This means that while their products are often priced a little higher than some of their competitors, you’re also able to relax in the knowledge that all ingredients are high-caliber, and that significant thought has gone into each and every formula. NutriSource use a wide variety of protein sources in most of their foods, including chickpeas, lentils, peas, egg, and those lesser used (but equally awesome) meats such as bison and quail. So, they’re a brand with lots of variety! 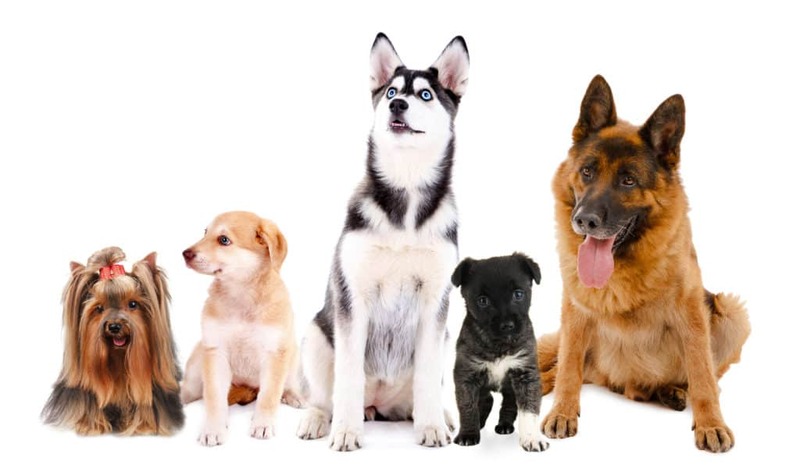 While they don’t make breed-specific puppy foods at this point in time, they have a vast array of formulas that include all life stages, target seniors, and puppies, and that also address the nutritional requirements of larger, medium-sized, and smaller dogs. Have you seen the Good4Life label on all their puppy food and dog food bags? This is the name for NutriSource’s exclusive and proprietary ingredient blend for puppy and dog foods. It’s based on Proteinated Micronutrients. Still confused? This means that NutriSource put things such as probiotics and prebiotics into their special formulas in an attempt to maximize the proportion of nutrients your canine friend can actually absorb. Have been around 1964, so they know their stuff! This NutriSource puppy food is not only completely free from all grains, but it’s also A-OK to feed to your grown-up doggy friends. What this means is, it’s certified by the AAFCO as a complete and also balanced dinner for adult and growing dogs alike! All-natural flavorings in this one! Both chondroitin for super joint health, and glucosamine. Nope! This awesome formula doesn’t even contain any kind of egg! 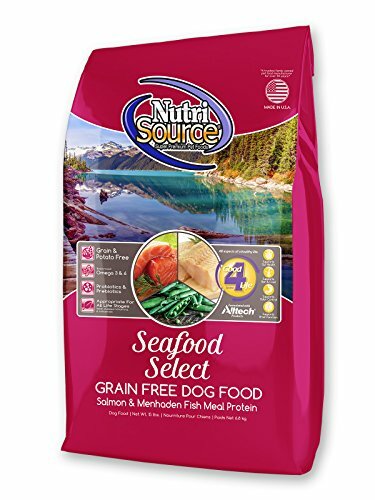 This both a delicious-sounding puppy kibble and one that contains protein from at least two different sources- peas and salmon. This can be pretty great for your puppy if you have a sneaking suspicion that he may be allergic to something; if this is the case, however, please check with your vet. Here’s a healthy chicken option for your adult dog or dogs. Of course, genuine chicken’s top of the ingredients list, and the main source of fat is also real chicken. It’s also got probiotics for easier digestion. Chondroitin, alongside glucosamine, Vitamin E, and a whole wide range of essential nutrients, including manganese, zinc, copper, and iron. Because NutriSource is most definitely a premium brand, it’s possible that you might find that this kibble is priced a little higher than some other brands. There are no by-product fillers or suspicious ingredients in this NutriSource kibble for adult dogs. Fat is preserved in a natural way, and as per usual we’re very happy to see both peas and alfalfa in the ingredients list. Smaller kibble pieces make this puppy food perfect for your small or medium fluffy friend’s tiny jaws and still-growing teeth. This chicken puppy meal is a super-rich source of protein and minerals. DHA, in conjunction with other well-balanced amounts of naturally-sourced Omega 6 and 3. So it’s not a special grain-free option, but we’re having a difficult time thinking of anything else at all that isn’t awesome about this healthy, mineral- and vitamin-rich puppy food. Five stars out of five! We heard you, large puppy breed owners! We’ve included this super-popular recipe in our NutriSource large breed puppy food reviews because there’s pretty much nothing about it that we don’t just love. Kelp and peas provide the key minerals here, as well as A, B1&2, D, E, and C vitamins. Impressive, huh? As larger pups can require more daily calories and thus more kibble, you might notice the premium pricing a little more than a smaller puppy breed owner might. NutriSource score very, very highly in our book. 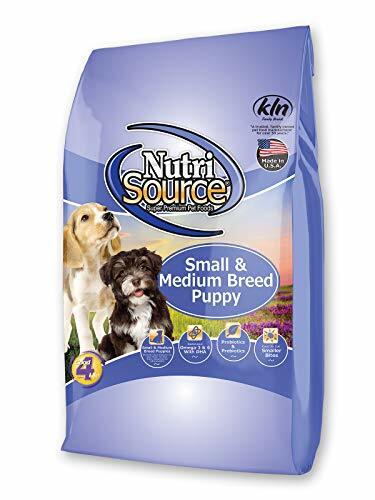 This NutriSource large breed puppy dinner’s no exception, as you can see from the excellent nutrient profile, high-quality ingredients and low GI formula. Another five-star option. Wet dog food is a fantastic way to give your dog a rotational diet. Incorporating this yummy grain-free chow into your best friend’s diet is a way to avoid giving him too much or too little of any one nutrient or ingredient. Great for both puppies and more mature dogs. Real chicken in the first spot, ingredient-wise! Salmon oil will give your puppy or grown-up friend a natural and healthy dose of DHA. This is both egg- and grain-free, so we’re having a tough time deciding what not to like about this puppy chow! NutriSource put a lot of effort into keeping their dog- and puppy-owning customers about the benefits that their pooches can enjoy from a rotational diet. This wet food’s a prime example of how giving your fluffy friend a range of different ingredients doesn’t always mean that you have to switch up brands. Is it a wet dog food? Is it a grain-free dog food? It’s both, actually. 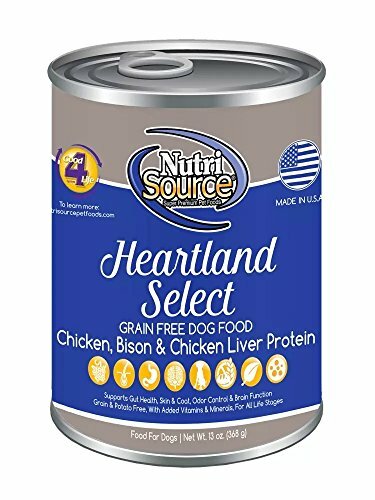 The Heartland Select formulas are NutriSource’s way of feeding all kinds of breeds, and all stages of development, at the same time. Legumes, superfood cranberries, and kelp for vitamins and antioxidants. In our eyes, none really. For a pretty darn economical price, you can get 12 cans at once. How’s bison not an incredibly original way to get your puppy some variety? This formula comes with a special and easy-to-follow set of feeding instructions and really does cover all those doggy life stages from 4 weeks up to seniors. Lamb and chickpeas are given starring roles in this adult (and also grain-free!) dog food. It isn’t formulated to be hypoallergenic. However, it skips the main allergens of beef and also grains in favor of both peas and lamb. No artificial, yucky by-products to be found here! Fat’s at 18% and from an easily-identifiable source- chicken! Alfalfa, beans, and peas all act as natural vitamin sources. Contains egg and chicken fat, although both are all-natural. 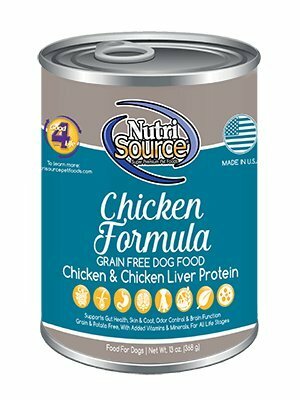 If this adult formula dog food was entirely chicken- and egg-free, we’d give it 5/5 for a hypoallergenic option. 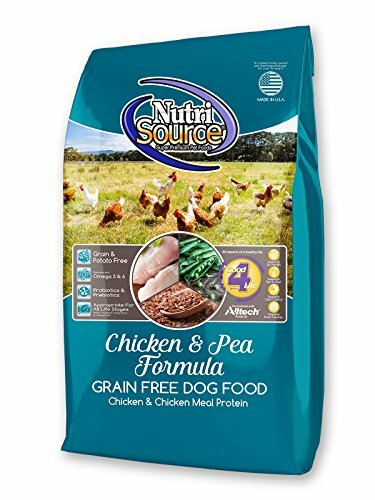 Well, we’d give it 5/5 if we weren’t recommending it for dogs who may have intolerances because it’s a super-duper, all-around healthy dog food. Good news, buddy, oats are gluten-free! Well, that is, they’re gluten-free if they’ve been properly processed and remain uncontaminated in any way. What you need to be aware of is that, quite commonly, the ingredients used in mass-produced foods- no matter how high quality they are- may come into contact with one another during processing. So, even if oats are the only grain present in your puppy’s food, you cannot rule out the possibility that they haven’t come into contact with ingredients such as rye, or corn. 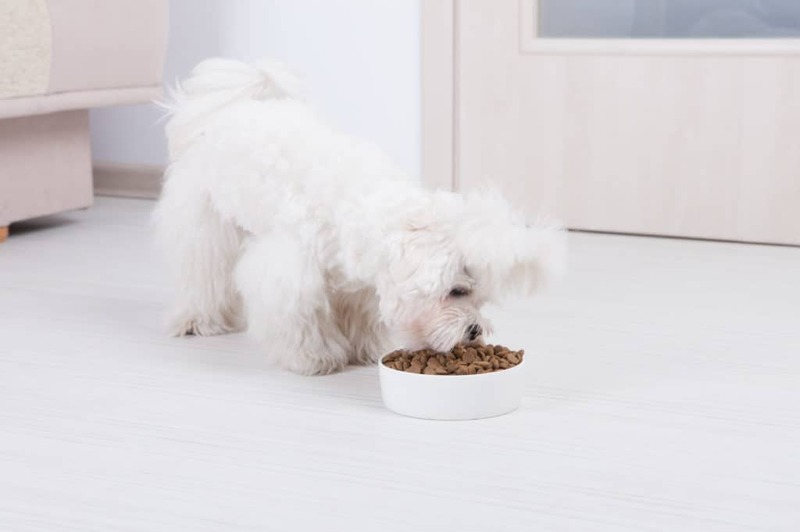 If you’ve got a gluten-free puppy, it’s usually best to stick to a specially crafted grain-free puppy food. On the plus side, if you’ve got a puppy who’s just fine with grains, oats are a very nutritious source of both protein and the skin-friendly silicon. That’s one of the main reasons why premium brands such as the ones in our NutriSource food reviews include oats and oatmeal into their puppy food and dog food formulas. Vitamins K, B6, B1, A, and C are all found inside peas- and each plays a different role in keeping your puppy healthy, growing properly, and well. Vitamin B12, in particular, is pretty good for avoiding lethargy, growth problems, cerebral health, and a well-functioning gut. Peas give your dog fiber and protein, too! They’re a carb source that’s gluten-free, and super smooth on your puppy’s digestive system. Peas are actually one of the veggies that vets recommend as a healthy extra puppy snack for these very reasons. If this is something you’re interested in, you can give them as a treat in their frozen state, steamed, or even just defrosted.